Merry Christmas everyone!! Well, technically Christmas Eve, but same difference. This post is way overdue. I meant to post this two days ago, but we traveled up north, and although I did bring my computer to edit photos and post, I could not connect to my sisters internet. I think it was cause it was snowing none stop since we got there, but who knows. I will say this though, I am so happy to be back in Gilbert where our normal during the day is in the 50-60, instead of 12-15 degrees. Brrr!!! Anyways, I really wanted to get this recipe in by Christmas cause it is so delicious and so stinking cute!! 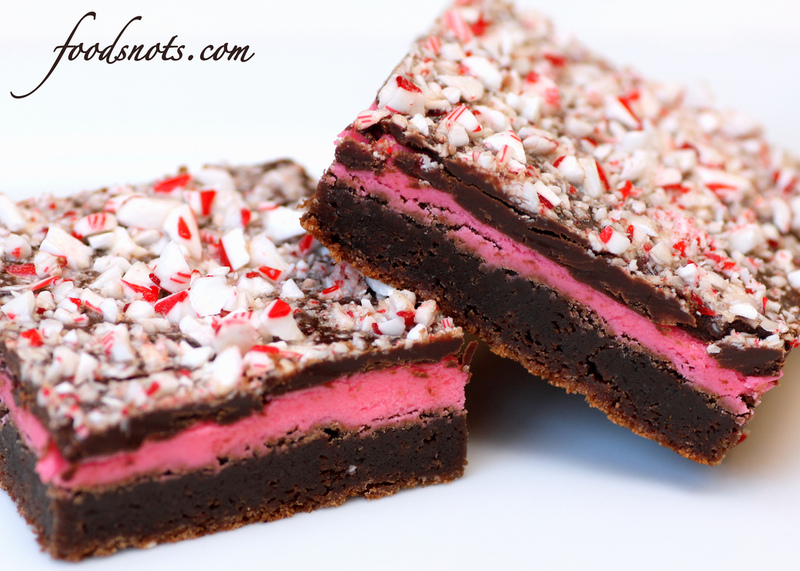 The bottom is a super moist brownie, which you could substitue for brownie mix if you want something a little easier but gorgeous 😉 The middle is a peppermint frosting, and then covered with chocolate and crushed candy canes. Yum, right!? It’s amazing!! Hope everyone has an amazing Christmas and as always, Enjoy!! Preheat oven to 350 degrees. Roughly chop baking squares so they’ll be easier to melt, then place them in a microwave-safe bowl along with the 2 sticks of butter (cubed). Melt in 30-45 second intervals, stirring in between, until melted and smooth. Set aside. In a stand mixer or with electric beaters, beat eggs for about 3 minutes until thick and frothy. Add sugar and vanilla and beat to combine. Then add in the melted chocolate butter mixture. Combine flour and baking powder and whisk into brownie batter by hand until just combined. Pour into a lightly greased 9×13 pan. If you want to make the job much easier, line your pan with foil first. Bake for 20-25 minutes. Test with a toothpick for doneness and don’t over bake! When brownies are done, cool on a cooling rack. When completely cool, pop in the fridge to chill. (makes the frosting spreading easier). Combine all frosting ingredients and beat until light and fluffy. Add extra milk by teaspoonful if you need a little more. Spread evenly over cooled/chilled brownies and place back in the fridge to chill again while you do the final step. Place chocolate chips and butter in a microwave-safe bowl and cook in 30 second intervals until smooth. Set aside for a few minutes, stirring occasionally, so it can cool off just a bit. Quickly spread over top of brownies (spread quickly to prevent melting frosting). 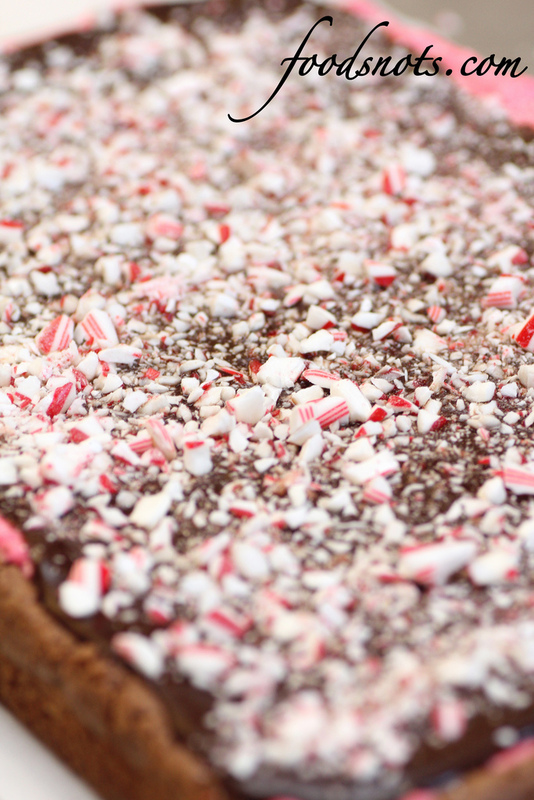 Sprinkle the crushed candy canes on top and return to the fridge until chocolate is set on top. Remove from fridge a few minutes before serving. Cut into squares and serve.